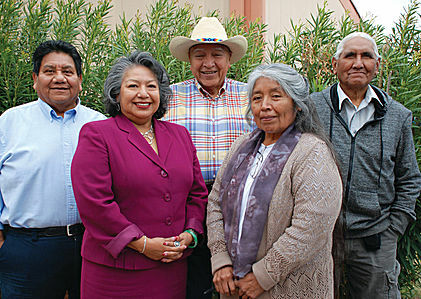 Left to Right: Bernard Siquieros, Libby Francisco, Anthony Chana, Ofelia Zepeda and Jonas Robles. Chairwoman is from Stanfield, Arizona and traces her family roots to the O’odham in Mexico. She is a Regents’ Professor with the Department of Linguistics at the University of Arizona and is Head of the American Indian Studies Department, also at the University of Arizona. She earned her Bachelor’s, Master’s and Doctorate degrees in Linguistics from the University of Arizona. Vice Chairman is from Sells District. He is the Education Curator of Himdag Ki: theTohono O’odham Nation Cultural Center & Museum. He earned his Bachelor of Arts Degree in Education at the University of Arizona, and conducted graduate studies in education at Arizona State University. He is a former director of the Tohono O’odham Nation Education Department. Secretary is from Ge Aji (Gu Achi) District. He is retired from Pima Community College, where he worked for thirty years as a counselor. He continues to teach Tohono O’odham History and Culture as an adjunct faculty member of Pima Community College. He earned an A.A. from Phoenix College and a B.A. in education from Arizona State University. Mr. Chana is an Elder Member of the Board of Trustees. Board Member is from Gu Achi District and was Gu Achi District Chairman for thirteen years. He is a Substance Abuse Counselor with Tohono O’odham Behavioral Health. He attended Pima Community College and Northwest Indian College. Mr. Robles is an Elder Member of the Board of Trustees. Board Member is from San Xavier (Wa:k) District. She is the Chief Operations Officer of the Tohono O’odham Gaming Enterprise. She earned a Bachelor of Arts Degree in Political Science from the University of Arizona.